Technopath Multichem U Control is intended for use as a third party, bi- level, liquid stable multi-analyte control designed for use in the routine monitoring of precision of laboratory testing procedures. Target values are provided for 13 analytes including kidney function parameters, pituitary/adrenal metabolites , hCG and urinary proteins. Multichem U Control is designed as a bi-level liquid stable product. The product will typically be run after reagent calibration and at a frequency dictated by laboratory QC procedures and reagent / instrument manufacturer instructions. 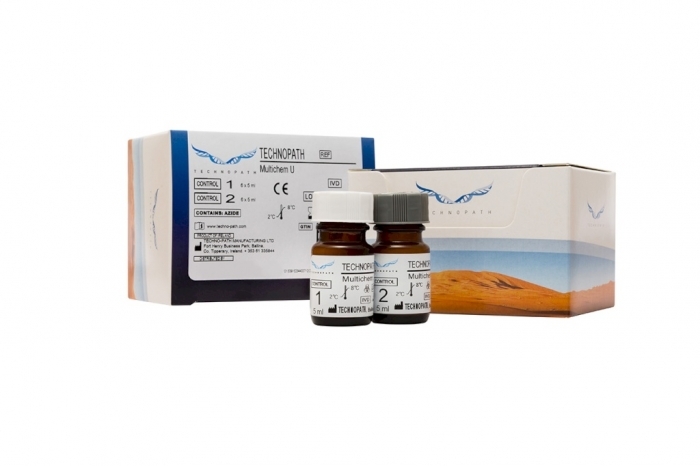 The product should be treated the same as patient specimens and run in accordance with the instructions accompanying the instrument, kit or reagent being used. . The control is to be stored at 2°C to 8°C and mixed as per IFU prior to use. The control is to be stored at 2 to 8°C between use.